A large area of showers and storms is developing east of Honduras and Nicaragua. Quickscat satellite does not indicated a surface low yet, but a mid-level low appears to be centered just off of the northeastern Nicaragua coast. 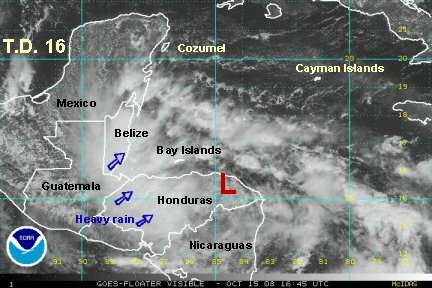 Heavy rain can be expected in Honduras and Nicaragua with scattered heavy showers north to the Cayman Islands and the Yucatan. Forecast models develop this feature some but take it northwest, then west. That will give it a limited time for organization. 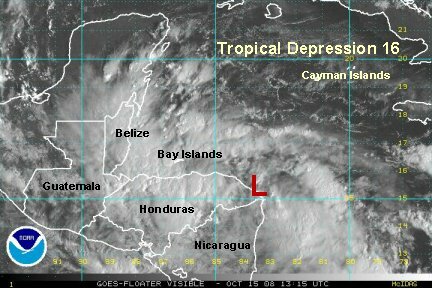 It is still possible that a tropical depression or storm may form before moving inland over northwest Honduras or Belize in the next couple of days. Last edited by Caribbean Traveler on Tue Oct 14, 2008 7:11 pm, edited 2 times in total. 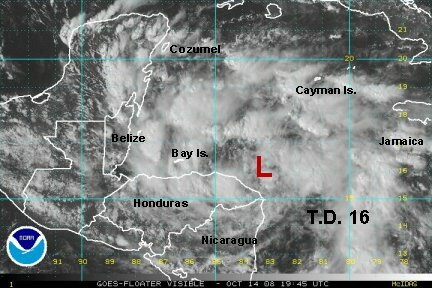 It appears that a low is trying to develop just off of the northeastern coast of Honduras. Heavy rain will likely fall over Honduras, the Bay Islands north of the Honduras coast, northern Nicaragua, and Belize. Several inches of rain will fall under the heavier thunderstorm bursts. The forecast models take this system westward along the coast of Honduras. 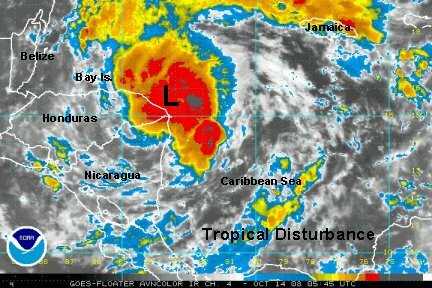 It has a fair chance of becoming a tropical depression. It just depends if it stays off of the coast long enough. We can't rule out that it won't make tropical storm strength either. 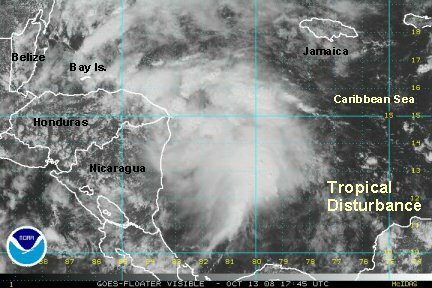 The tropical disturbance is slowly but surely organizing. Winds aloft are favorable for development, and we think that there is a good chance that this will be classified today. NHC will not likely do this until the Hurricane Hunter investigates late this afternoon. In either case, expect heavy rain in nothern Honduras, northeast Nicaragua, Belize and the Bay Islands over the next couple of days. The forecast models have shifted slightly north, taking this system westward into Belize in a few days. If this track is correct, there is a better chance that it will actually strengthen into a tropical depression and possibly storm. T.D. 16 is moving west just north of the Honduras coast. It appears to be far enough off the coast to allow for further strengthening. With this being the case, it has a good chance of being named tropical storm Paloma soon. Heavy rain bands stretch north to near Cozumel and eastward to Jamaica and westward to Belize. The latest satellite imagery shows squalls moving southwest over the Bay Islands north of Honduras. Winds may gust to around 35-40 mph in the squalls. The center should be over the Bay Islands late tomorrow afternoon or evening. T.D. 16 has changed little over the past few hours. If anything it is slightly weaker. The National Hurricane Center has top sustained winds at 30 mph. That seems ok to us. 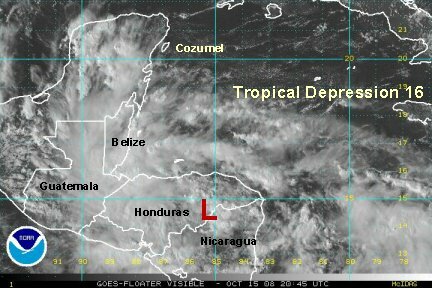 The low center is still offshore of the northeast coast of Honduras. The strongest squalls are now near Belize. The primary threat will be heavy rain over the next couple of days. 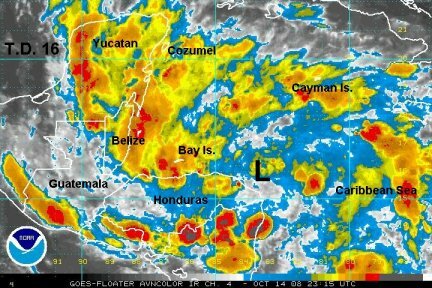 Several inches of rain is possible in northern Honduras, Belize and over the Yucatan and southern Mexico. T.D. 16 has not changed much since last night. 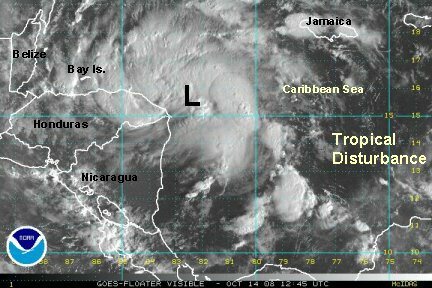 It appears that the center of the low is near the coast of northeast Honduras. If the low is inland, it will not become a tropical storm. Right now, it appears that this tropical cyclone will either stay a tropical depression and dissipate, or strengthen slightly to a minimal tropical storm for a few hours if it stays off the coast. In both cases, the major impact will be heavy rain through the next 24-48 hours. Rainfall totals may be in the 5-10" range for locations in stationary bands. Other locations will see significantly less. This morning the most active banding is in Belize. Please let us know how weather conditions are where you are. Send your replys to our "Eye of the Storm" thread - Island Reports! We'd love to hear from our patons from the Bay Islands, the Cayman Islands, Cozumel, or any other location being affected by T.D. 16. Visible satellite imagery shows that the center of the surface low has drifted south of west and is about 25 miles inland over eastern Honduras. T.D. 16 will not develop any further if it stays over land. Some models still keep it barely offshore and NHC has it still briefly becoming a tropical storm late tonight. We think the better solution is that it will continue just south of west, stay inland and dissipate in 24-36 hours. The tropical moisture will remain for another day or two, even if the tropical cyclone dissipates. Several more inches of rain is possible in the more persistent bands. At this time western Honduras and Belize has the heaviest rain. It looks like T.D. 16 is history. We disagree with NHC on its movement. They keep it moving west, where we think it is moving wsw. It is near the border of Honduras and Nicaragua about 50 miles inland. With it moving farther southwest, it may actually develop in the Pacific! T.D. 16 is inland over Honduras and is expected to dissipate in the next 24 hours. A few inches of rain is still possible in heavier squalls. This will be our last update on T.D. 16, unless it moves into the Pacific and regenerates.